Microblading is the process of temporarily tattooing your eyebrows on using a specialized tool that helps to create the effect of individual hairs. Microblading is intended to look natural, adding volume and fullness to your brows with ease. It can be done with colors that match your natural or existing hair color and eliminates the need to regularly fill in your brows with makeup. Our eyebrow technicians are licensed and skilled professionals that have experience in the art of microblading. The process of microblading is rather simple as the angled tool lightly slices your skin and implants a colored pigment to match your hair, creating the illusion of individual brow hairs. The tool is able to create multiple ‘hairs’ at a time to speed up the process of creating your brows. Like tattoos, microblading will include several procedural ​Before & After Care​ tips that we’ll share with you once it’s been completed. These steps are important to the healthy maintenance of your newly-microbladed brows. The benefits of microblading are straightforward as they increase the appearance of your brows, giving them a natural yet full finish. The small strokes of pigment are intended to look natural, so your brows will end up looking as real as possible. Clients enjoy the flexibility that the microblading process gives as it is customizable and only temporary. The process is usually pretty quick, taking anywhere from 1 – 2 hours and will only need to be completed every 6 months, as the pigment is fairly durable and long-lasting. While you may experience some redness and stinging after the procedure, it is entirely normal and will subside the longer your brows have time to heal. If you have sparse or deteriorating eyebrows, you may be a candidate for microblading. The process will add volume and fullness to your brows and is ideal for those with patchy brows or uneven growth. Microblading will easily fill in the areas that are uneven and can add a defined yet natural shaped to your brows. If you are prone to skin infections, are pregnant, or have other health concerns, you may not be a candidate for microblading at this time. However, one of our trained technicians will consult with you beforehand to determine if microblading is the best option for you. Microblading is temporary and will fade on its own over time. Clients enjoy that the commitment is not long-term, like getting a real tattoo, but can easily be touched up or removed with ease. Microblading does not damage the skin around your brows if they are looked after well after the process and allowed to heal properly. The ink used in the process is semi-permanent and is delicately matched to the hair color of each client. 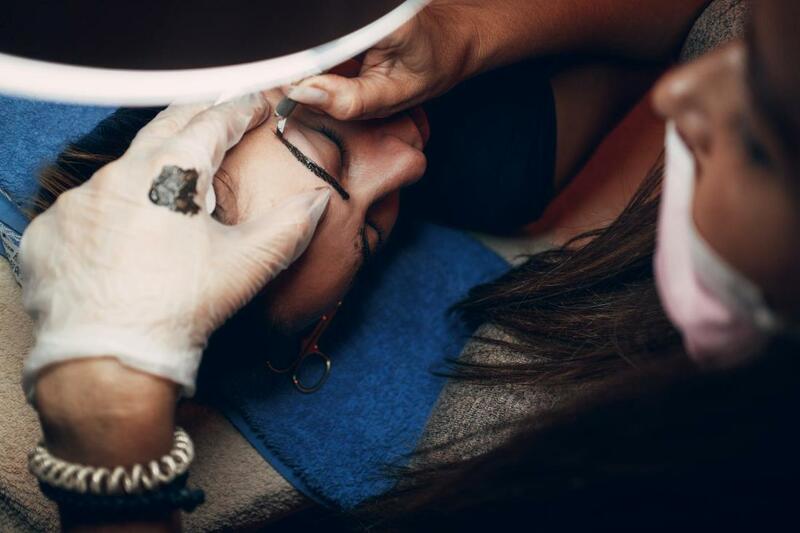 Each of the tools we use to perform our microblading services are professionally cleaned and sanitized to avoid infection or spreading of bacteria. We use disposable instruments, where necessary, on one client only, per session.